I just received a pair of lovely Crawlings knee pads from JustForYou, Kids to do a product review. Dot was so excited to try the new pale pink bunny theme Crawlings knee pads when they first arrived. She quickly put on the knee pads with my assistance and all ready to go out! 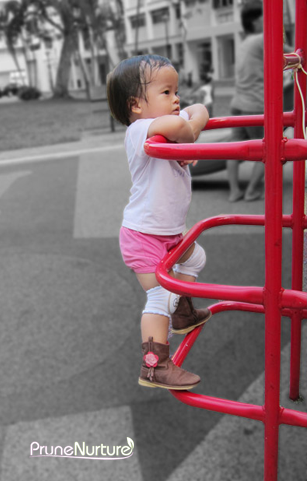 My active toddler loves to run, jump, climb and slide down at the playground. We started bringing her to the playground when she was about 14 month old. Now at 26 month old, she is especially excited when she has playmates to play with. She will run around and try to follow what the older children are doing, even climbing up bars that she will not do when she is alone. As usual, she has great fun but this time with an extra protection – the Crawling knee pads! It is a good product especially for a very active baby or toddler who are more prone to injury. The Pink Pale Rabbit design appeals to Dot and she was very excited when she first saw the knee pads. It is easy for her to squat down and the holes/ventilation at the back make the knee pads breathable and comfortable for her. However, I find it rather pricey for a pair of knee pads. It is not just for crawlers but also for toddlers who are now running and jumping around. it is recommended for ages 6 months to 3 years plus. Currently, there are 10 designs of Crawlings knee pads. More designs will be out in July 2012. Crawlings supports miraclefeet – a nonprofit that treats children born with clubfoot around the world. Read more about miraclefeet here. The body of knee pads is 80% premium cotton, 15% rayon, 5% spandex; soft, stretchable and comfortable like a sock to move and grow with the child. The embroidered designs on the front of the knee pads. It is vented at the back of the knee pads for additional comfort. One size fits most – 3″W x 5 1/2″ L.
Elasticized band at the top and bottom of the knee pad. Center knee pad cushion is made of EVA* cushion that is soft, flexible and UV and water resistant. All materials used are colorfast and machine washable in cold water. Tumble dry in low heat or air dry. No bleach. * EVA is popularly used in equipment for high impact sports such as hockey and boxing due to its characteristic as a shock absorber. Victoria Beckham also tweeted about Crawlings knee pads. Each pair of Crawlings knee pads costs S$26.00 (inclusive of normal postage within Singapore). The first 10 customers who read this review will enjoy 10% discount by just mentioning “Prune+Nurture” when placing order with JustForYou, Kids.